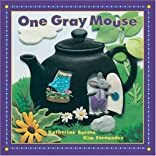 From "One gray mouse in a black mouse house" to "Ten red snails in a gray snail pail," learning to count has never been so much fun! A colorful cast of characters, cleverly shaped from Fimo, helps young children learn colors, animals and the numbers from one to ten. Kids will have fun following the adventurous mouse as he scampers from picture to picture, gathering objects from every page. About Katherine Burton (Author) : Katherine Burton is a published author of children's books. Some of the published credits of Katherine Burton include One Gray Mouse.